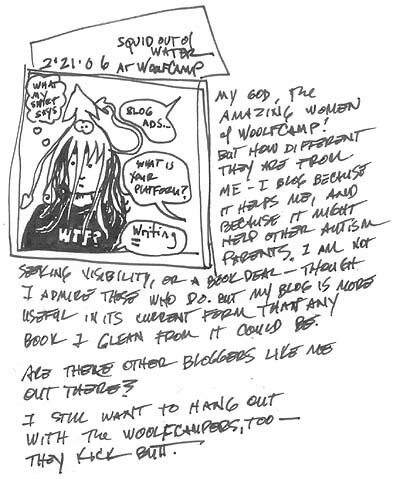 I have to admit that I was a bit leery of WoolfCamp. Badger and Mary and Grace assured met that it would be divine, but most group-type things I've attended have been full of insecure whiners, and I don't like all that competition. Imagine my shock in arriving at Grace's groovalicious pad to find it chock-full of high test, beyond-cool blogganeers. (I probably still don't get how cool they all were, and are.) Imagine my relief at being the token gripey introvert! Yeah! My daughter Iz (7) got dragged to camp with me so that her extroversion could be my shield. Turned out I didn't need it and she sure as hell didn't need me; she entertained herself effortlessly while Badger and Grace made certain that I got to finally meet cool people like Jen (whose existence I'd enjoyed reading about but had never physically verified). Then I got to hang out with my blog acquaintances Mary, Minnie, and Grace, all of whom are tantalizingly not-quite-local to me because they don't live within my city limits. I was also introduced to asskicker after asskicker: Chris, Kristie, Amber, Debbie, Elithea (E), Sarah, Peter, Elke, Emily, Lisa, Debra, and Gwen. Wow. Rook (Hero! Diaper changer without even being asked!) watched Mali and Iz so I could attend Debbie's session on feminist businesses, ethics, and blogging. Though I didn't really get what the session was going to be about before stumbling into the room with (because of?) a glass of port in my hand. Debbie, I apologize for all my tangent diving. Mostly I was blinky-eyed and confused about being in a room full of quite serious Writers, many of whom see their blogs as publication launching pads. Whereas I am all about the love and community, baby. Plus I am a fortunate: I don't need writerly income, though it would be nice. I never set my sights on publication; in fact I believe that blogs are superior to books for special interests, like, erm, autism parenting. See, parents of autistic kids frequently feel as though they can't find enough information, especially because the condition has no known cause or cure. No matter how many books a person buys on the subject, and because publishers won't give the authors more than 300 pages to tell their stories, the resulting "guidelines" are by necessity swiss-cheesed. Parents truly desperate for every scrap of information are left to figure out the backstories and connect the dots, themselves. Blogs like mine comprehensively document years of the day-to-day reality of living with autism in a way I would have killed to access in 2002, after my son's initial diagnosis. Admittedly, readers have to do some wading (it's been 2.5 years, and I don't focus solely on my son and his autism), but I think my blog is still useful. At least I hope it is. Anyhow, and despite my digressions, Debbie and the rest of the crew (Mary, Jen, Emily, Gwen, Badger, Sarah, Grace...did I forget anyone?) managed to get across good points about blog ads/blog revenue being cool if you're into it, about any publicity being good publicity, about how giving content away for free can increase both readership in general as well as real book sales. And I salute them all, even as I felt like a squid out of water (see cartoon below). My favorite camp moment may have been 14-month-old Mali banging on the back porch's French doors, pissed off that she couldn't get inside and dance to Prince with everyone else. My favorite person was, of course, un-hostess Grace. Where does your energy come from? Bottle it and send me some. Please! And thanks muchly and sincerely to you and Badger for bringing everyone together. 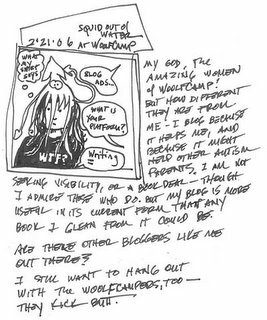 I so very much hope to stay the whole time, and really talk to people, at the next local WoolfCamp. P.S. I missed Jo Spanglemonkey, but was glad she called mid-camp.